The new SHR series features a simple and neat bottle design in PETG with a gentle arc to the top of the bottle, ranging from 50ml all the way up to 300ml. As a material, PET is light weight, highly transparent, glossy, and offers excellent impact resistance. Further, the material is non-toxic, offers fantastic barrier properties, and safe for all sorts of uses. The full size is quite popular among personal care brands, especially those that offer shower gel, shampoo, travel items, and more. The SHR line can be paired with any number of closures also available from SRP, including screw caps, disc tops, flip tops, sprays, pumps, etc. The bottles themselves can be fully transparent, translucent, or custom coloured to match any brand or line colour require. Special masterbatches can easily be produced. Decoration techniques applicable include screen printing, hot stamping, labelling, metallizing, gradient printing, and more. In response to growing market demands, especially on the part of parents, consumer expectations of baby products are getting higher and higher as products become more sleek and stylish. With the combination of sustainability and a wide range of contemporary designs for baby products, SR Packaging introduces a collection of Boston Round bottles made of recyclable PET that is perfect for baby care solutions. SR Packaging has introduced a selection of eye-catching thick wall PET bottles into its packaging portfolio. The bottles boast a significant 1.4mm thick wall for added depth which grants a luxury look and feel for a stand-out look on the shelf. To offer its customers more packaging choices in different materials, SR Packaging has launched a new series of complementary PET bottles with a distinctive smooth, wide angle shoulder. Baby care products, shampoo, liquid soap, lotion and many other personal care products can benefit from the simple yet strong lines of the PET bottles which are available in 100ml, 150ml and 300ml capacities. At the cutting edge of both packaging technology and beauty packaging trends, SR Packaging can customize the amount of PCR material in its packaging according to brand requirements. SRP's extensive range of products —tubes, bottles and jars— can be produced with up to 100% PCR material, according to customer preference. SR Packaging has developed a new dual-layer Soft Body bottle. Benefiting from two layers of plastic, the bottle has a soft-touch texture, which feels smooth and elastic to the touch, and exciting to hold as it sensually stimulates the fingertips. The perfect combination of a vacuum pump head and super flat tube, SR Packaging's latest offering will be a hit with beauty brands looking for an airless tube that stands out from other options available on the market. Rebelling against expectation, SR Packaging's new flat airless tube offers a fantastic addition into the beauty manufacturer's product portfolio. SR Packaging introduces its services in the latest catalog brochure that forecasts 2019 packaging trends. SR Packaging doesn't pay lip service to lip packaging products - it services the lips 100% to ensure a luscious, rich, kissable mouth all day long. The company's latest launch, the NBR lip tube, enhances lips to the fullest to ensure that they take the spotlight. Everyone loves to get pampered: A moment of indulgence where everything else slips away into the background and the only thing that is in "focus" is that which is being pampered. That is the very reason SR Packaging has created its feathery flocked lipstick tube, for lips to be indulged as product is applied. True to the company's roots of being at the forefront of beauty trends, the latest cosmetic delight to be launched onto the market by SR Packaging is an ultra-thin make-up brush tube pack. SR's tube packaging incorporates an ultra-thin applicator brush that is soft and springy, pampering the skin as it applies cosmetic product delicately to the face. SR Packaging has developed a brand new lip care tube for the cosmetic market which incorporates an unbelievably soft applicator. The super-soft cotton lipstick tube will delight consumers with its unbelievably soft hair brush head that is ideal for delicately and smoothly applying colour, gloss or cream. The packaging combines an ease of use silicon brush applicator on the tip that is gentle on the skin during personal cleansing process. It also allows users to enjoy a SPA massage experience similar to a professional treatment. One of SR Packaging's core competencies is that it is a company which is always at the forefront of the beauty packaging industry trends and introduces the latest packaging innovations to both eastern and western markets. Through the firm's cutting-edge facilities, it regularly brings new packaging developments to its customer base, so that brands can take advantage of new trends. SR Packaging has just introduced a brand new tube concept to its packaging portfolio. The new tube design features a silicone dropper type spatula for lip gloss, lip balm, lipstick and many other makeup items, allowing for ease of application with ultra-softness. 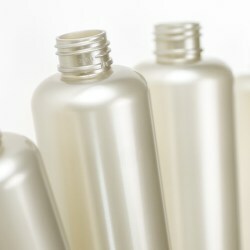 SR Packaging introduces new travel-sized PET packaging bottles, dispensers, and overcaps. The small volume is a better option for travel kits and can be used for a wide range of skin care products. The overcap secures packaging dispensers to be taken about in bags and enhances the entire design. SR Packaging introduces its new packaging tube with brush applicator made of extremely fine and soft PBT bristles. Consumers can now experience a light and gentle touch on the skin instead of irritating spikiness when using harsh brushes. SR Packaging Introduces a new, superfine sponge applicator for its packaging tube design collection. SRP’s R&D team confirms this cotton-like sponge texture offers brand new sensation and upmost delight user experience. The new lip gloss tube with silicon applicator is a brand new design by SR Packaging offering consumers a whole new user experience that keeps lip colors pretty and healthy. SR Packaging Group has its global web available for international connections. By attending China Beauty Expo, the firm gathers its team from different locations to interact with large number of visitors. SR Packaging adds aluminum shells as a part of the dispensing pump or sprayer that results in a glossy and shiny appearance for design dispensers. SR Packaging is one of the few packaging suppliers that provides complete service covering a wide range of product types in Taiwan and ships internationally. SR Packaging has several advanced technologies that can help brands and companies to achieve a desirable matte effect. Matte finishing can turn a transparent, see-through object into a more luxurious and mysterious item. With a sturdy base, the SD series offers an elegant and simple shape that is perfect for skin care, cosmetic, hair care, and many personal hygiene products. With capacities of 60ml, 120ml, 180ml, and 240ml, the SD series can offer a number of benefits. Labelling is a kind of adhesive paper or metal foil that is pasted directly onto a container. It can be applied to a variety of bottles, jars, tubes, and other products. It can make the design of a piece of product packaging eye-catching. It attracts attention on the shelf with visual effects, whether applied to beauty products, pharmaceuticals, or other sorts of products. Bottle gradient effects are produced by using spraying techniques, the colour goes from deep to light, and can give bottles a soft haze or multi-level visual effects. It can be combined with silk screening, hot stamping, labeling processes, and others. Flexo printing is a rising image printing method suitable for soft packaging materials. This printing effect can offset printing more clearly, finely and greatly enhance the design making it more diverse. This is an octagonal bottle series of four square and 12-sided chamfer-cut designs. Compared to generally square bottles, there is more light refraction in the translucent sense, along with a simple neat shape, and when placed on display shelves offers more storage space. 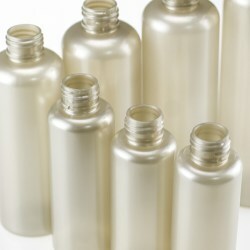 SR Packaging has released a new and attractive series of PET bottles designed for a number of uses. The rounded contours and simple shape of the SH-F series is well known to consumers and is associated with daily cleansing products such as shampoos and conditioners, or household cleaning items like kitchen dishwashing liquid. 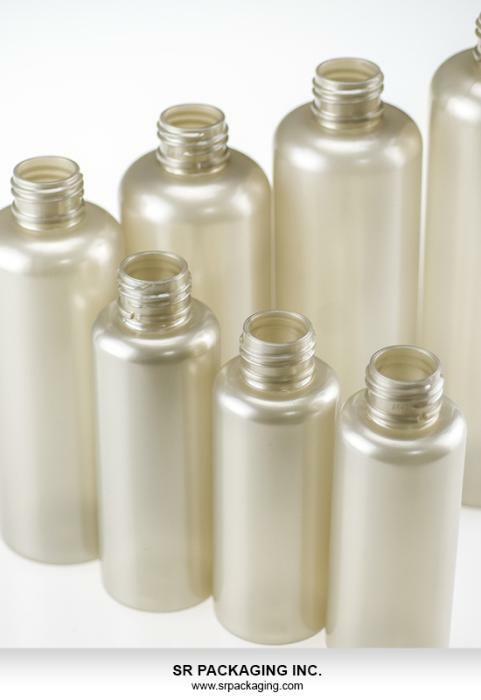 SR Packaging has released a new bottle line made of PET that is light weight, highly transparent, glossy, impact resistant, non-toxic, tasteless, safe, and proof versus weak acids. French brand NARS has released its limited Tahiti Bronze Collection, and has included a new Laguna Tiare Bronzer. This limited bronzer edition features a wood grain, embossed plastic compact developed by SR Packaging. The warmth of paper and its appeal to the senses, for example, is something the firm has experimented with, and has released a new coating for tubes. SR Packaging's new concept is based on cutting edge printing technology such that a company can design a unique visual effect and feel. SR Packaging's latest series of bottles are designed to reflect the classical style of stately Roman columns, with an elegant shape that is rendered even more attractive by using high quality PET as the base material. SRP now offers the ability for firms to decorate their products with a mesh gradient effect, produced through standard silk screen printing. The technique allows companies to produce a shading effect when using monochrome printing.